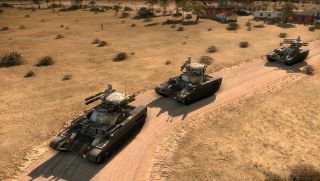 Eugen Systems has released a pre-alpha gameplay trailer for Act of Aggression, the near-future RTS it announced last year. The studio says the game will hearken back to the "golden era" of the genre, with base building, resource management, mass unit production, and three competing factions with unique abilities and technology. Two of the game's factions appear in the trailer: The US Army, a "brute force of veterans," tough and battle-hardened but saddled with current-gen technology, and the stealthy, secretive Cartel, which has access to the latest military prototypes but isn't as well suited for a stand-up fight. The third faction, the UNO-funded Chimera, is a more well-rounded force: "You can mold their units through upgrades into specific roles," Eugen said, "or leave them as a jack-of-all-trades." Act of Aggression will feature large maps and supply lines, but will be a "much more intimate" experience than the Wargame titles—European Escalation, AirLand Battle, and Red Dragon—that have taken up Eugen's time over the past few years. A release date hasn't been announced, but it's expected to be out this spring, following a "VIP multiplayer beta" that will take place sometime in the next few months.